This is a continuation of my reflection on Evangelion‘s characters as they relate to my growing up. Be forewarned, there are spoilers galore! 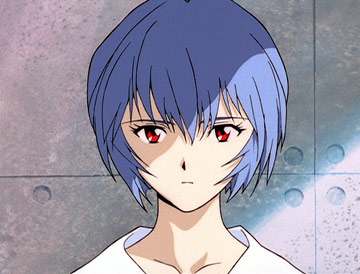 Rei Ayanami is an enigma within the Evangelion series. From her very first scene to her very last, she appears out of nowhere, watching Shinji silently. She too is an Evangelion pilot, but she doesn’t ooze the teenage hormones as much as the other pilots. She is quiet and determined to follow any order faithfully, even if it means it will lead to her destruction. Asuka compares her to a doll (sorta like the doll Asuka’s mother favored as her daughter, which may be another reason why Asuka hates Rei) because of her lack of emotions. Behind her quiet demeanor, Rei is still just a girl. The only person who showed her kindness was Gendo Ikari, but when his son steps into the picture, everything changes. Before his arrival, Rei only smiled to Gendo. Before his arrival, Rei kept mostly to herself. But Shinji made her smile, made her try new things (such as cooking in both the manga and the Rebuild movies), and made her care about others’ survival. Throw in that Rei is a clone of Shinji’s mother Yui and you have yourself an Oedipus Complex like no other. The second Rei dies before Shinji knows this, as she sacrifices herself for Shinji out of love. Even with the next Rei, she proves she isn’t a doll. My shy, quiet nature might have cast me as cold and uncaring to some people, but that is far from the truth. Like Rei, I had fleeting thoughts of, “don’t worry, if I don’t achieve something, there is another me that will.” Here I am, bringing my twin issues back into this, but moments where Rei brushed off danger with thoughts of her insignificance really resonated with me. Granted, I realized my relationship with my twin brother was more like Rei and Kaworu’s relationship rather than Rei and her “sisters,” meaning we are fundamentally the same but also very different; we’re just siblings. I really liked that contrast, and it made me feel just a little bit better about my own significance. You don’t have to be a twin to wonder who you are and why you matter in the world. Growing up, I always did as I was told. Do these tasks and you will achieve this specific grade. Do these steps and you will get through work. Many of us have done this. Many of us have also done things we didn’t want to do. Rei lives her life as a source of pleasure for Gendo but also as his puppet. However, in the End of Evangelion, Rei finally finds the courage to snap the threads controlling her. Instead of following Gendo’s orders, she takes a bet on her own heart and goes to Shinji. That scene in particular really spoke to me. I still do things I don’t want to do from time to time, but I’ve learned that saying no and doing what I want to do isn’t the end of the world. Granted, it kind of did lead to the end of the world in Evangelion, but that is beside the point. Despite what Asuka claims, Rei is far from an emotionless doll. She is flawed, like every human being. She is not Yui, Shinji’s mother. Rei Ayanami is a person. Like me. Like you. This is the big one. At the age of fourteen, Shinji Ikari was afraid of other people, afraid of how others perceived him, and, most of all, hated himself. He rejected his father’s request to pilot a giant robot many times, a request that many children (hell, even adults) would jump on given the opportunity. Some people say this makes Shinji a terrible main character, that he is whiny and overly emotional. However, I love Shinji simply because he was me. During my first viewing of the series, I too was a fourteen year old boy. I too felt insecure and afraid to get close to others, the hedgehog’s dilemma. Though I hated the people around me at school, I hated myself most of all. I lacked confidence in myself. I exaggerated my failures and drowned in self-pity. Granted, I didn’t have daddy issues (he worked two jobs when I was younger so I really didn’t see him all that much, but I was able to see him more once he went down to one job) nor do I have access to a giant robot (maybe someday…), but the connection was there. If I couldn’t be Shinji, I could at least easily see myself being friends with him. Every episode, I hung onto every scene he was in. out of Tokyo-3 out of fear of further destruction of the city. Asuka goes into a coma after being mentally raped by an Angel. Misato becomes distant after the death of her love, Kaji. Shinji increases his distance from Rei after he learns the disturbing truth behind her existence (harken back to the Oedipus Complex I mentioned earlier). I pitied him, but I knew the pain of being abandoned. In elementary school, I met my first friend that wasn’t a relative. I used to do everything with him, but then he left for another school. We talked over the phone a few times after that, but our friendship quickly fizzled and died. With my brother in different classes, I went into middle school alone. 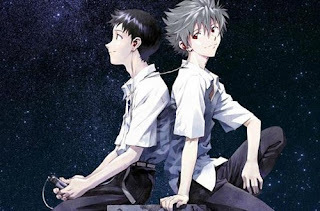 I actually like the friendship that blossoms between Shinji and Kaworu (inb4yaoipairing). Sure, you could argue that the time Kaworu entered the scene was a bit too convenient, during a time when Shinji was incredibly vulnerable, but it wasn’t like Kaworu was completely using him. He let Shinji live in order for him and humanity to continue. Kaworu cared enough for Shinji to sacrifice his own life, and that’s saying something. Sure, their friendship is kind of the opposite in the manga, but even then Shinji feels regret for killing Kaworu. Their friendship is brief but significant. For me as well, friendship saved me going into high school. When I felt alone and lost, friends were there to dig me out of the darkness. Expanding on the need of companionship, The End of Evangelion was a critical time for both Shinji and myself. 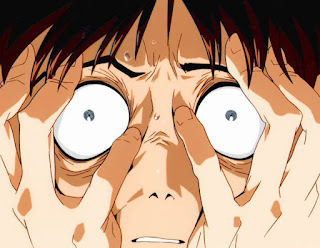 The Human Instrumentality Project reached its boiling point, and Shinji had to make a decision: either accept Instrumentality and have every single soul become one or keep living an ordinary life with the threat of being hurt and rejected by others. Either retreat from the world and everyone in it or allow yourself to get close to others. Shinji’s scream always makes my spine shiver. In the end, Shinji rejected Human Instrumentality and allowed humanity to once again regain their separate forms. Life is full of pain, but he realized there are people he cared about and others who cared about him as well. I had few friends in middle school, but I wasn’t completely alone. I had a family who cared about me and the few people who did associate with me I wouldn’t trade for the world. Like Shinji, I wouldn’t throw my relationships away, good or bad. If it’s all or nothing, I’d rather keep them all. What little good I had made the bad bearable. 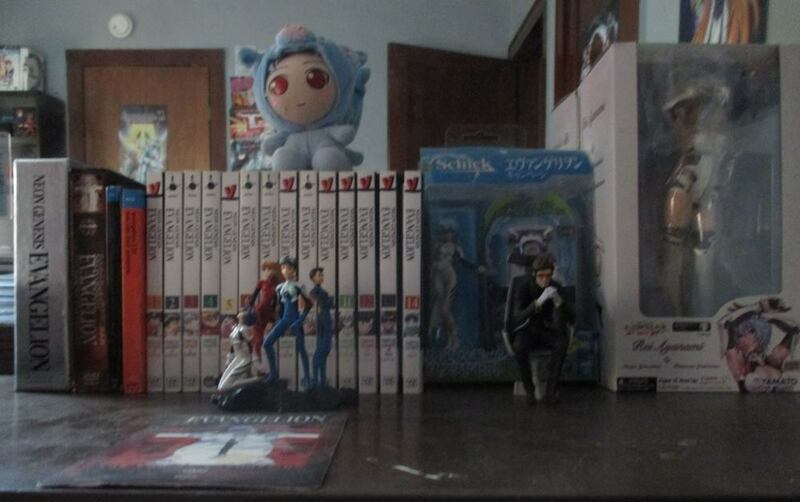 After first finishing the series, I felt a sort of hollowness, a farewell to friends who meant the world to me. But I took the lessons I learned and applied them to my life. I developed a barrier around my heart to defend against the people who picked on me. I wasn’t perfect nor will I ever be, but I developed the strength to stand up to my bullies. If I hadn’t experienced Evangelion (or Xenosaga for that matter, but again, a blog for another time), I’m not sure how my life would have turned out. I’ve grown a lot since I first watched Neon Genesis Evangelion, for the better and worse. Asuka, Rei, and (especially) Shinji will always be a part of me, but I know I’ve become less like them since leaving my teenage years behind. I still have shreds of them left in me; I still fear getting close to people sometimes and I still have days where I despise who I am, but it no longer controls me. I accept the roles those three characters played in my childhood, and I will never let go of the memories. As I move forward, I’m starting to relate more to the older characters. From being afraid of being alone by 30 like Misato to longing for the past like Gendo, my adult anxieties only promise to increase with age. For an anime now 20 years old, I’m still learning how to cope with who I am through its characters. I don’t always agree with the direction of the series (the countless spinoff manga, Evangelion 3.33, the ridiculous products), but the anime and manga will always remain the classic that helped me through a difficult time. I hope I continue to learn from it as I continue down my path in life. Thank you, Hideaki Anno, for expressing a dark time for yourself in a way that mirrored my own soul as well. …Here’s hoping Evangelion 4.0 comes out before the 25thor even 30th anniversary of the series.